It was last September when comedian Vic Sotto confirmed his engagement to actress and longtime girlfriend Pauleen Luna. Rumor has it that it could be by the second week of January 2016, but the latter said that the details of their wedding will be revealed in "God's perfect time" and that it has not yet come. The actress, however, got irked with ABS-CBN for revealing the date and venue of her wedding with Sotto and expressed her displeasure through a Facebook post which she subsequently deleted. Pauleen is set to share the details of her wedding exclusively on Eat Bulaga soon. 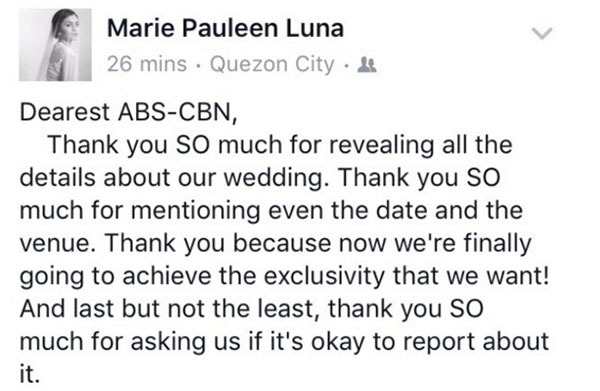 According to Fashion Pulis, ABS-CBN News reporter Mario Dumawal got the info from Lolit Solis, Pauleen’s manager, in an interview. 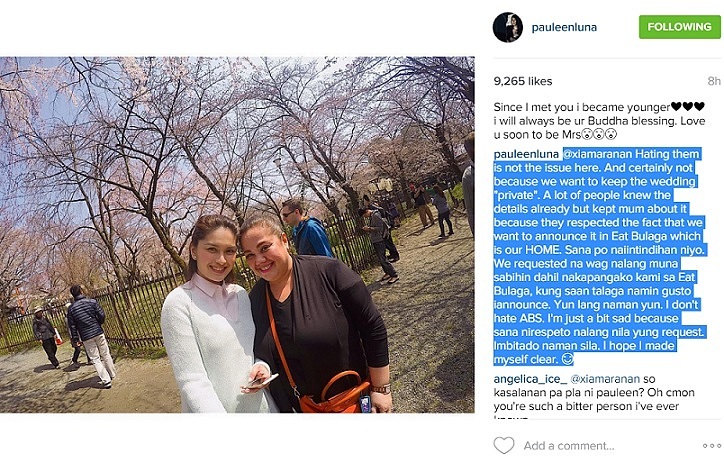 Now, Pauleen answers one of the comments on her posts where she was accused of hating the other network.